The news that Conservative leader David Cameron's six-year old child died yesterday is very sad news indeed and there is probably not a person in the country who would not want to extend their sympathy to the Cameron family. It was even enough to unite all political sides of the House of Commons yesterday - an event rare in itself. The loss of a child in any circumstances is a thing none of us can begin to understand fully unless it has happened to us, whether the child was able-bodied or handicapped, ill beforehand or not, in pain for a long time or a short time. Small wonder, then, that there is counselling for parents who have undergone such a tragedy. Or at least there is now, thank heavens. The story got me musing about the case in my own family history. My maternal grandmother was born at the close of the 1800s in Bermondsey, South London. She was one of twelve children (they certainly had large families in those Victorian/Edwardian days) and life was hard and poor, but happy. As a young child she used to play on the newly-built Tower Bridge on the top level, 143 feet high, (which incidentally was closed to the public in 1910, as jumping off it was a very popular way for some people to commit suicide). Among the children she played with were some brothers and sisters from an equally very large family in the neighbourhood. She particularly fancied one of the boys as she grew up and they began to court (or date, as I suppose it is now known). Surprisingly for a working-class lad leaving school at 14, he managed to get a job as a junior in a bank across the river in the City and my Nan considered him to be a very good catch indeed. Unfortunately, events got in the way and he volunteered in 1914 to be one of the first to fight for King and Country in France and Flanders. He was only 21 in 1917 when a bomb exploded and shattered his leg and eye, causing his part in the war to be over, as he had to have that eye removed. My Nan still thought he was a good catch, though, and they married after the war. He had returned to his job in the bank but because he only had the one eye left, he found it very hard to add up very long columns of figures in small hand-writing (adding up in his head, mind you - no calculators then, you know). The strain on his good eye was such that he was having bad headaches and could not cope. He had no option but to leave the bank and try to seek work elsewhere but with only one eye, bad headaches and the moving shrapnel in his body, it was difficult for him to get suitable work in an already depressed post-war era. down with whooping cough and double pneumonia. There were no antibiotics in those days, so infection was either something you fought on your own or surrendered to. The three children were admitted to hospital, but sadly the 6-week-old and the the three-year-old died within days of one another IN THE SAME WEEK. Only the 18-month-old (my mother) miraculously survived, although it left her with a weakened heart for the rest of her life. My grandmother and grandfather must have felt beside themselves. There was no counselling in those days... you just had to gather your skirts and carry on. I remember my Nan telling me years later that the worst thing she found to deal with was when friends or neighbours would actually cross the street to avoid talking to her, as they did not know what to say. If only they could have raised the subject with her and mentioned the children's names, she would have been comforted, but instead they shunned her and would not bring the subject up at all, as if the children never existed. Looking back, I don't know how my grandmother managed to cope. My grandfather, much later, had a job he could immerse himself in, but my grandmother was on her own at home bringing up her surviving child. In middle-age, she moved from house to house never settling. If she could not move house, she would move the rooms around,swapping the bedroom for the lounge and vice versa. Or if she could not do that, she would move furniture around within a room. All signs of restlessness and a troubled mind. In her old age she was almost agoraphobic, refusing to go out, even to buy food, and would rely on her husband or, when he died, my mother to do it for her. To lose two children in a single week must have been dreadful for her to bear all her life, but I seldom heard her speak of it. The only hint of what she must have been going through was a very large, old sepia photo (of her three-year-old daughter - I don't suppose she even had time to get a single photo of the six-week-old) which always hung larger than life in a gilt frame over the mantelpiece of her bedroom. Now my grandmother is dead, that picture is now wrapped in brown paper and resides in a cupboard under my mother's stairs. It is something my mother will never part with as it is all she has of her older sister. I doubt I shall ever be able to part with it, when time comes for me to take the picture over. It is the legacy of my grandparent's grief which is still affecting generations almost eighty-five years later. Dulwich Divorcee has very kindly tagged me. The instruction is to go into my photo collection, take the fourth folder and the fourth picture in that folder and explain it. Then tag four more bloggers to do the same. I only started selling stuff on ebay about two years ago. Until then I had barely heard of ebay and had certainly never gone into that website. The reason I started came about quite by chance. A friend had dropped her much prized china teapot on the floor and it had shattered into a thousand pieces. She had immense difficulty finding a replacement of that particular pottery/pattern and, as she did not have access to a computer, she asked if I could look on ebay for her. As I say, up until that point I had never ever looked at ebay, let alone bought anything, but not only was I able to track down the very teapot she was searching, I managed to outbid some very fierce competition and get the teapot for her. She was so grateful she asked me to repeat the whole exercise all over again to get a spare teapot, just in case she ever wanted to bounce that one on the floor too. Within weeks she was the proud owner of two identical teapots, courtesy of my forays into ebay. After that, I got bitten by the bug. I quite liked lurking in the background until the auction was due to end and then I would pounce out of the blue and place a bid before any other interested parties could retaliate. I bought quite a few things on ebay after that and found some unusual and very apt Christmas presents that way too. Shortly after that I decided to put a few things on for sale myself to test the water. I found that things sold quite easily and that I was able to de-clutter the house and make a bit of profit in the bargain. It also coincided with the time when Kay decided to go on her Latin-America trip. The conditions of her trip, laid down by the organisers, were that she needed to save up money for the trip herself, where at all possible. To that end Kay took a part-time supermarket job for a few months, but it was obvious she was not going to be able to save it all herself without her school work suffering. So I offered to help by selling off a lot of her things - clothes that were too small or toys she had outgrown. It helped to empty over-full cupboards and drawers, while at the same time making the necessary funds required. The fourth photo of the fourth album above is one of those items. A book Kay had when she was a toddler. 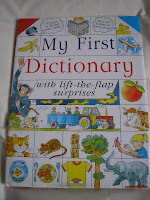 A dictionary with lift-the-flap pictures with the words underneath. Now Kay was studying for A-levels, it was hardly going to be of any use to her any more. It sold for £2.25 plus postage. Not probably a vast amount of money in itself, but I figured if I sold every surplus book, toy or piece of clothing for that price rather than throw it out or give it away, I could make a real difference. In fact, in the space of about a year, I was able to give Kay about £600 towards her airfare, just from ebay sales alone. And our house was benefiting from the ebay sales too by beginning to look less like a jumble sale in a tornado! Since Kay's trip, I have not stopped selling on ebay. I am still gradually de-cluttering the whole house. Every now and again, I will go through a room or a cupboard and think "Do I really need all this?" and try to be ruthless. Half will get put back in the cupboard or drawer, the other half destined for ebay. I spend an afternoon writing up the ads and getting the pictures done. It is making me quite entrepreneurial. And the house is getting tidier! All bad things come in threes, don't they? I am hoping all bad things come in threes, making the way clear for only good things to happen thereafter. Do you get the impression I may be just a bit superstitious? Let me explain. Yesterday was The Big Day - a day we had been waiting for for months. Kay had an interview at a university in Yorkshire. These interviews are like gold-dust and the fact that she had been selected for interview was in itself an achievement, even if she was not successful to receive an offer of a place afterwards. The course she wants is so popular and there are ten applications for every place. Two universities have already rejected her without even an interview, despite the fact she has top grades for the courses, purely on the fact that they had too many good-quality applicants. We had heard that this particular university in Yorkshire is so popular that it only interviews 20% of applicants for that particular course - and of that 20% only one third are actually selected. So Kay has been lucky to get that far. Over the last few weeks, she has been getting very very nervous, researching the sort of questions she might be asked, and I admit to secretly biting my fingers down to the knuckles too. I just hoped and prayed that we would get an auspicious day for the interview. Would fate have other things in mind? We had to be up at the crack of dawn as well, which did not help. We woke to a clear sky and icy streets. Greg had promised us a lift in the car to the local commuter train station, but his offer was first off and then on again, once he discovered the car locks were frozen and he could not open up the doors. He managed to prise open a door on my car and we were halfway to the station when we came upon a traffic accident which blocked our thoroughfare. One completely mangled car was being hoisted onto a transporter lorry, another four cars were lying on the roadside in various states of smashed metal and two policemen were sweeping broken glass away from the centre of the road. (Quite how or what had happened is still unclear but by last night someone had tied bouquets of flowers to a lamp post which suggests to me there had been a fatality.) (Bad Thing Number Two) Thinking selfishly of missing our commuter train, Kay and I sprang out of our car and ran along the icy streets as fast as we could to get the train, as there was now no way Greg could get us there in time. It was then that Kay mused that bad things happen in threes. She knew and I knew that we did not want the third thing to be her interview. Once in Central London, we caught the train from Kings Cross up to Yorkshire and it was on the way that (thankfully) the third bad thing happened - it snowed heavily. 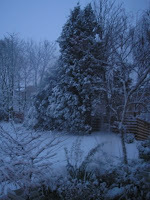 Weather forecasts for Yorkshire for yesterday had been for fine sunshine (if cold) but no snow was predicted at all. 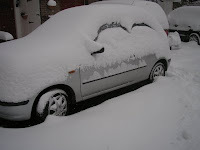 In fact it snowed the entire day from the moment we arrived at about 11.30 am until the moment we left at around 5.30pm. Kay was wearing her fine interview clothes and high heels.We did get quite wet on the way to the university (so Bad Thing Number Three). I had to separate from Kay for most of the day, while she was treated to a group lunch, tours of the campus and had her interview. While Kay was thus locked inside for several hours about to meet her doom, I had hoped to kill time looking around the town and find some of the university accommodation to see how far it was from the campus, look at the shopping area, gain a general impression maybe. But with the snow falling quite thick and heavy, my attempts to wander nonchalantly around were thwarted, not least because there was a cold wind and I had meanwhile got lost - it was snowing so much, I could not even stop to open up the street map I had bought months ago! With my head down against the bracing blizzard, it was proving all too impossible to look around me. In the end, I managed to find the town centre, have a sandwich and join Kay at a pre-determined time, sitting with her for the final moments leading up to her interview. So hopefully that was the three bad things out of the way, leaving only good to come at the interview stage. Kay's impression was that the interview went so-so. She has no idea what they thought of her and will only know in about six weeks if she has been successful. But we have to live with the odds that only one in three interviewees will get through to the next stage and that once three bad things have happened, it leaves room for the good things! Fingers (and everything else) crossed. I recently wrote that my cholesterol level was found to be a bit high. My weight at 11 stone is also the highest it has ever been. Married life and comfort-eating (mostly in the last few crazy years of living with Greg) have seen my weight spiral a bit to the point where I am just beginning to creep inside the category of "overweight". My GP gave me a prescription for statins but I am loathe to start taking them, as they can can cause unpleasant side effects, so I thought I would first try to reduce the cholesterol in more natural ways if possible, before resorting to the statins. To this end, I decided to watch my diet, to take garlic capsules (of the odourless variety, I might add), said to significantly reduce cholesterol, and to increase my exercise levels. much to my amazement. It has all paid off. Already I have lost seven pounds in two weeks without even trying and am now 10 stone 7 pounds. I should start to see some change in my shape too. I am already noticing my clothes fit much better this week than they did two weeks ago. I would like to lose a further stone or even stone and a half, before I shall rest easy. That will put me back to the weight I was when I was a young slip of a girl and got married. 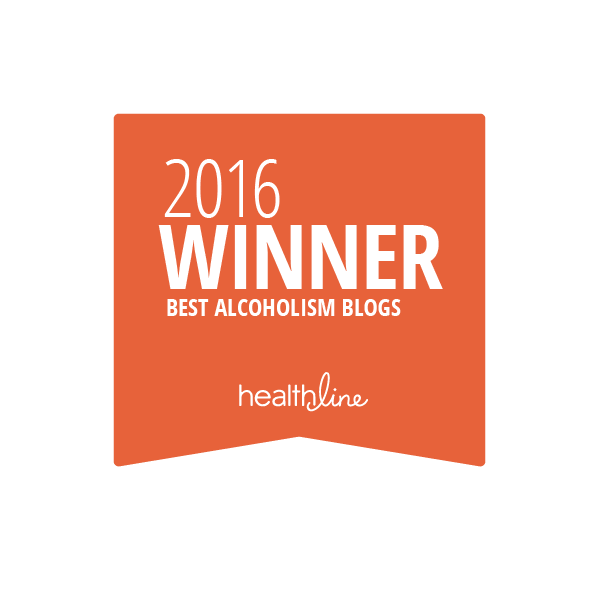 If Greg can lay off the alcohol, then I can match him by laying off the cholesterol. I plan to have a fasting blood test in about 6 weeks' time to see whether the cholesterol levels in my blood-stream are indeed reducing as well. Trouble is, I could murder a packet of chocolate biscuits!!! We had a visitor last weekend. A very old friend of Greg's from university days. We had not seen him for the last 25 years or so. He had been ensconced in work up in Yorkshire, we down here in London, and our paths had not crossed again until now. Having established over our recent exchange of Christmas cards that he was in London at the moment for a few months, we invited him over for the day. Greg told him beforehand not to bring any alcohol with him as "we are not drinking much these days because of medication." I must confess to being really pleased, if not astounded, that Greg kept to this mantra I had offered him as a way out. I had been fearful that with a friend he had not seen for so many years there might be an excuse for a boozy celebration, but he stuck to his guns. As a result, the friend did not bring any alcohol, we did not serve any and a good day was had by all as we exchanged 25 years of our mutual news. Maybe there is light at the end of the tunnel after all. 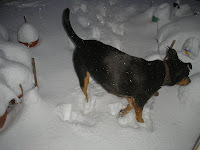 Meanwhile, Snoopy went out in the garden to inspect the strange stuff. That ruled out any attempt to get in the car and drive, but we had already decided on walking anyway. We waded out of our cul-de-sac (we were the first ones to leave on foot this morning, so the snow was virginal,untouched and high enough to spill over our boots!) Then we turned into the usually fairly busy road to find there were no cars moving at all and people were walking down the centre of the road, taking photos. 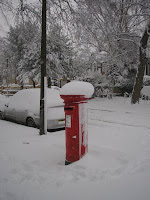 I could not resist this photo of our local Royal Mail post box. When we got to the town centre, there was indeed no buses or trains at all. The main arterial roads were by no means clear and were covered in thick churned-up slush. Cars were so far and few between ( and only driving at about 5 mph) that we were able to cross the roads without even glancing at the traffic lights. There was no way Kay was going to get to her school which is about 4 miles away (other than walk of course, but that would probably get her there in time to turn round and come home again!) While we were deliberating what to do next, she bumped into two of her good friends who were also assessing what to do. They decided to go off in a clump to one of their houses (presumably to have snowball fights or listen to music!) I meanwhile waded back home and am warming up and deciding whether to take Snoopy for a walk or not. Having lived in Germany, I am well aware that other countries experience far worse snow than this and still manage to function perfectly normally without this much disruption. They must be laughing up their sleeves at us with no buses or trains, grinding the capital to a halt. But I suppose it is because these sort of conditions are so rare for London, that it does not warrant us owning a fleet of snowploughs to deal with this once-in-18-years-occurrence. It sure looks pretty though and I am going to go off and make a hot chocolate to drink while I gaze out at the lovely sight from my window.